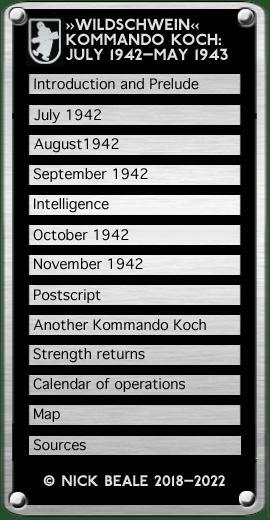 The earliest contemporary reference I have so far found to Kommando Koch itself is from 1 August 1942 when Ob. Süd was allocating infra-red telescopes to Luftwaffe units. The purpose of this Nachtsuchgerät (night search device) was defensive: it would show heat sources—a night fighter’s exhaust for example—as a yellow or reddish spot of light, and three of them were issued to Kdo. Koch. Although this offers us a date by which the Kommando was in, or destined for, the Mediterranean Theatre, tthe unit is not readily identifiable in the (often incomplete and obscure) order of battle reports transmitted at that time. It was not until the 16th that Fliegerkorps X gave figures for two unnamed units—with 3 (0) and 3 (2) aircraft—one of which may have been the Kommando. Nachtsuchgerät … detects a night fighter … by mean of two telescopes [Gläser], each of length 18 cm and diameter 8 cm … The apparatus can in some cases be connected via an amplifier to a warning system, a modification known as "Armin" … Prisoners of war have indicated that each telescope is attached to a 2 millimetre cannon [sic] pointing rearward like a sight, so that the telescope “looks” in the same direction as the gun and has a field of view of 30º. NOTE: According to Ob. Süd, the Nachtsuchgerät was also known as NSG, Katze (cat), Katzenauge (cat’s eye) and Handspanner (hand-peeper) and it had been successfully tested by Luftflotte 3 at a range of 800 metres. Deliveries to Ob. Süd had been due to start on 15 May. Two Ju 88 carrying Caruso were operating on the night of 1/2 August, apparently in connection with an attack by aircraft of I./LG 1 on tanks and vehicles near El Alamein. At 2240 hours on the 3rd/4th, a lone Caruso-equipped Ju 88 operated in support of an Italian attack on Valetta, Malta. On 2 August an He 111, GJ+JH flew from Kalamaki to Heraklion, Crete; Allied Signals Intelligence overheard its wireless traffic but did not yet know that it belonged to Kdo. Koch. NOTE: He 111 H-6, W.Nr. 7424, GJ+JH would be 15% damaged in a crash landing at Stolp-Reitz on 10 May 1944. At that time it was serving with the Beauftragter für Hochfrequenzforschung (Commissioner for High Frequency Research), Travemünde. (Information courtesy of Norbert Schuchbauer). One aircraft successfully carried out Wildschwein [wild boar] operation until both apparatus failed. The English are attempting with very strong forces to break through the Sicilian Straits … This must not happen, if the blood of many thousands is not to have flowed in vain. Let every aircrew, every man at a Flak gun, every signals operator at a jamming transmitter be clear on this: this enemy must be brought to his knees. The reader should bear in mind that while this new radar might circumvent one aspect of the German disruption, ground radars and VHF communications were still vulnerable, so a means of homing on the jamming aircraft themselves was still needed. 6 August: It is probable that the recent jamming of RDF and VHF in Egypt by equipment carried in enemy bombers was experimental and that [he] is using every possible means of checking the effect on us. Deciphered messages in late July and again on 10 August told the British that transmissions from their own aircraft operating over the sea were being monitored from Kounavi in Crete,16 km south of Heraklion. The German listeners not only knew that the RAF was (say) using ASV in a given area but sometimes heard the sighting reports that were called in. A communication next day, from a Ltn. Ulrici in Köthen, asked Maj. Koch’s permission for a Fw 200 to be ferried from Cottbus to Bordeaux, where it would remain for a week. Ulrici’s message gave Koch’s address as “Athens-Kalamaki, 10. Fliegerkompanie”, the British remarking that this unit was part of Luftnachrichtenregiment 40. Aircraft is on an important task. Quickest possible dispatch is to be ensured under entire responsibility of supply forwarding station. Aerodrome command is instructed to follow the orders of [that station] with regard to the preparation of Castel Benito for night landing from 2030 hours onwards [and] arrangements for servicing the aircraft itself. Despite these demands, it was still in Catania, Sicily at 1520 hrs., leaving some doubt over whether the operation took place as planned. The night of 19/20 August saw another Wildschwein flight, this time to protect a U-boat which was damaged and unable to dive, and NR+AE left Athens-Kalamaki for Heraklion, as did He 111 GJ+JH. Arrangements were also set in train on the 20th for a Lichtenstein patrol ahead of the tanker Alberto Fassio, a radar-carrying He 111 of II./KG 100 duly taking off at 2100 to operate between the western tip of Crete, Tobruk and Derna, Libya. That afternoon Ju 52 NR+AE and He 111 GJ+JH left Kalamaki for Heraklion. “Pedestal" resupply convoy to Malta.